EFree Affiliated Scientist Bianca Haberl has been named High Pressure Science Coordinator in the Neutron Science Division at Oak Ridge National Laboratory (ORNL). 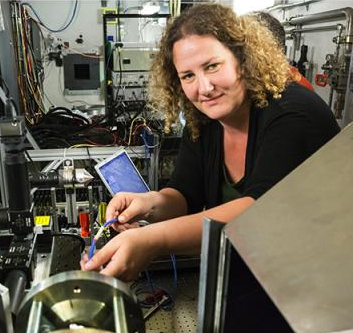 In her new role, she will be working to develop and consolidate high pressure neutron scattering methods at the different beamlines of the Spallation Neutron Source (SNS) and the High Flux Isotope Reactor (HFIR). Extending onward from her role as Weinberg Fellow at ORNL, Bianca works on optimizing various methods of high pressure synthesis of novel, potentially useful materials based on the Group IV elements carbon, silicon and germanium. She employs a suite of high pressure methods including diamond anvil cells, point loading and laser-induced microexplosions, and a range of different precursor materials, in particular amorphous and disordered materials with varying degrees of structural ordering and hydrogen content. Characterization of materials by neutron diffraction at the SNS at ORNL is a key research direction within EFree, which will continue to benefit from Bianca’s ongoing participation in the Center.